Excellent interview with Bev Petow and Michael Robb on CBC radio North by Northwest with Jennifer Chen. Two West Coast artists have joined forces to convince the world that steel can be a delicate and airy medium while still making bold artistic statements. 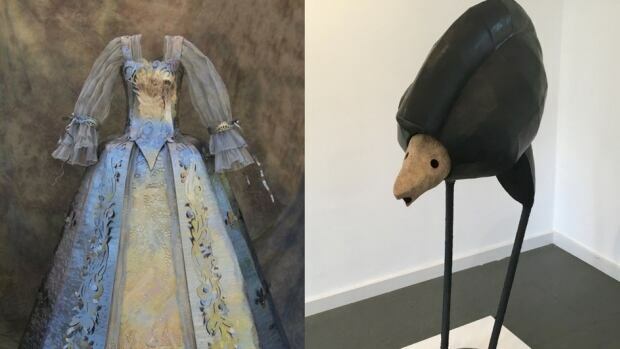 The jaw-dropping work of Bev Petow and Michael Robb is on display at Salt Spring Island’s Duthie Gallery and includes flowing steel dresses and quirky imaginative creatures. “It’s true, I watched people come in for the opening and I watched the jaws drop. It’s a very powerful show,” said gallery owner Celia Duthie. Bev Petow works on the upper bodice of one of her many steel dresses currently on display on Salt Spring Island. Robb is known for sculpture work creating fantastical creatures that would feel at home on the set of films like The Dark Crystal. “His work depicts a world that is not one I’ve ever seen,” Duthie told North by Northwest‘s Jennifer Chen, during a visit to the gallery. Many of the creatures have a marine critter-like feel to them which Robb said likely came from a harder period in his life. Petow’s metal dresses were also inspired by a time of hardship. In 2009, Petow’s close friend died. The two had spent many hours together sewing their own clothes before Petow moved into metal work. “I went out to my studio to make something in mourning for her, basically, and that’s what came out,” the Sooke-based artist said. Much of her work is inspired by political issues or historical moments, including one intricate dress that celebrates the era of the French Revolution. Petow said the revolt signified one of the first times Europeans stood up against the aristocracy. “I think we’re living in a time where that could happen again,” she said. 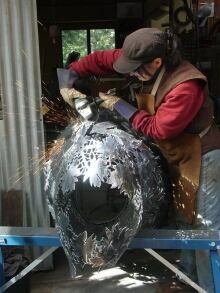 Delicacy of Steel is on display at the Duthie Gallery on Salt Spring Island until August 15th. This entry was posted in Uncategorized on July 24, 2017 by Celia. Installing the new show – Delicacy of Steel – magnificent steel gowns by Bev Petow. Opening Sunday July 2, 5-8pm. Show runs through August 15. This entry was posted in Uncategorized on June 25, 2017 by Celia. Without a Trace, Ken Clarke, woven willow. Delicacy of Steel is an exhibition of metal sculptures by Bev Petow, featuring her meticulously crafted steel dresses from the haute couture of the French Revolution – the ‘flamboyant self-indulgence of its “one-percenters” – to the loose body-conscious moderns with their fast fashion – these works of fine sculpture reflect a deeper concern with the uneven fabric of society so explicitly conveyed through attire. This entry was posted in Uncategorized on June 12, 2017 by Celia. Excellent review of Imprints 2017 by Elizabeth Nolan of the Driftwood. This entry was posted in Uncategorized on May 29, 2017 by Celia. This entry was posted in Uncategorized on May 4, 2017 by Celia. Susan Benson is on site at the gallery working on her Portraits of an Island series Friday, Saturday, Sunday 11 – 4. Show continues till May 7th. This entry was posted in Uncategorized on April 14, 2017 by Celia. This is an extended printmaking workshop designed to give participants enough time to produce a full edition of a multi-colour, multi-block linocut or woodblock print – two days of instruction with Richard York and two days to ready and print an edition. There will be a press and participants can practice the techniques of press printing as well as hand printing. Richard will be assisted through the workshop by Gillian McConnell so there will always be someone throughout the 4 days to assist with the printmaking. Workshop: Participants should come prepared with several ideas, designs, some images, photographs or compositions they wish to make into a print. This entry was posted in Uncategorized on April 12, 2017 by Celia. This entry was posted in Uncategorized on March 14, 2017 by Celia. The wildly popular Haute Couture show in the Abkhazi Garden in Victoria will continue through the new year. Bev Petow’s delicate steel gowns in the garden, inspired by the Princess Peggy Abkhazi, are beautiful and beautifully enhanced by the gracious garden. Don’t miss it! Her work is also showing at the Bellevue Arts Museum (by Seattle) through the new year. This entry was posted in Uncategorized on October 15, 2016 by Celia.